Conwy living sometimes feels a little charmed; whether it’s driving over the estuary at sunset, or walking through the medieval streets, there’s always moments waiting around the corner ready to enchant us. Being a hog roast Conwy caterer here, I get to be part of a myriad of businesses that serve the town, and I get to see a side of the town most people don’t, although the settings are familiar to all. 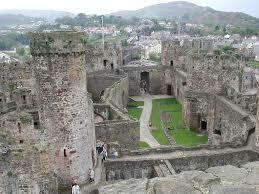 I work Hog Roast Conwy, and we’re working hard to ensure we give the people of Conwy the catering service it deserves. A little about how we work, to start with. We started off wanting to make our hog roasts as delicious as possible, which meant finding local sources who would supply us with the best looked after pigs, and designing our own custom spit roast machines. Then we branched out into all sorts of meat, from spring lambs to all the barbecue favourites. Now, we’re a fully fledged hog roast Conwy caterer which can take on the biggest (and smallest) of jobs. But we still stick to our principles of excellently cooked meat, and a truly efficient and delightful service, which is most of all customer-orientated – we do what you ask of us, not what is most convenient for us. That means we’ve put in the miles to ensure all our meats are as good as our hog roasts, and also, developing highly diverse menus to ensure that our roasts are complimented with sides, starters, desserts and canapés which are as good as the main course. 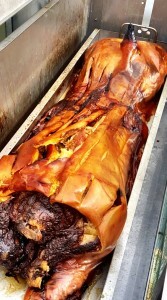 To illustrate, let me tell you a somewhat exceptional experience of mine had while working for Hog Roast Conwy! A couple approached us about our availability for a wedding, and fortunately for us (we never like to say no), we were free for their big day. But when we learnt where they were getting married, we were more excited than we usually are for the day. They had booked Conwy Castle for their wedding ceremony and reception, and they asked us to be the ones to keep their guests fed during an evening of much celebrating. The party went on into the night, and it really was an excellent occasion, roasting a hog in the grounds of a castle all lit up! It doesn’t get much more romantic than that, or more appropriate, once you see the (slightly less advanced) spit roasts they have on display in the kitchens! The happy couple were happy with a simple hog roast served in a roll, with apple sauce and crackling, but we have so many menus that it really could have been almost anything. We always end up getting lots of compliments, whatever or however it is we are serving up, and we really are having an excellent time of it, striving to be the best hog roast Conwy catering company we can be in this idyllic town of ours. If I’ve whet your appetite (literally or figuratively! ), give us a call soon so we can start discussing what you’ve got in mind before we get booked up.